The story of Robert Johnson’s guitar mastery, brief rise to fame, and death at the age of 27 is the stuff of legend. He came from nothing, sought fame and an escape from a repressed and destitute southern existence, sold his soul to the devil in exchange for the ability to play guitar and write the blues and died young in a nameless grave. As Snoop Dogg would later say: ‘Murder was the case that they gave me’, and Johnson’s death and possible murder is obfuscated by contradictory analysis and scant first hand knowledge. Tales generally involve a number of bottles of whiskey being consumed at a juke joint, followed by a number of days of sickness, ending in his death. Strychnine is often cited as the ultimate cause, but it is just as often denied. Johnson’s playing evolved from zero to 100 in a span of two years. He wrote and recorded a number of masterful Delta and Chicago style blues cuts in the backs of office buildings and hotels. History has vindicated, validated, vouched and veto’d his pact with the devil, who instructed Johnson to come to the crossroads at midnight. The devil took Johnson’s guitar, re-tuned it, played a few songs, and handed back the instrument. The pact was sealed. Soul sold, blues born. Johnson’s place in history secured. We have 29 scratchy recordings from Johnson, dating from the mid 1930’s. We don’t know how fast they should be played, how he played them (he faced the wall during recordings, which in and of itself has led to much debate: was he scared, embarrassed, hiding his technique, or using the corner of the room for acoustic purposes?) or what tuning he used, an issue that goes back to not knowing what speed the original recordings were made in. To this day, books and articles are written debating how he was killed, how much of the legend of the crossroads meeting is true, and where he is buried. No fewer than three places lay claim to that last distinction. Johnson remains the reference Delta Blues player, embodying Faustian mythology and defiant guitar technique, the quintessential artist. I am writing this while listening to a 1961 record (remember, those black discs that spun around while a needle scratched away at tiny grooves?) entitled Robert Johnson, King of the Delta Blues Singers. It was a landmark album, the first time in 20 years that Johnson had been heard and it came at a revolutionary time in music history. Rock and Roll was in its infancy, (although we think of things as moving quickly today, the new becoming old with a speed that leaves casual pop observers breathless, this was happening to the new genre of Rock at an alarming rate. Chuck Berry and Bo Diddley were already oldies. Doo Wop was dead, and just a few years later resurrected nostalgia acts were touring bingo halls. In five years the Beach Boys would go from the biggest American act to the biggest American nostalgia act, a rate of transformation alarming even by today’s jaded standards.) and even though artists were reviving original folk, original blues musicians were often overlooked. Re-released records such as this record were the first holes in the dam that held back the vast forgotten reservoir of America’s greatest popular export. Their rediscovery is still sending reverberations through the music community. Can you say “White Stripes” or “Black Keys”? Blues music was about to have a major impact on the formation of more driving, rhythmic rock and roll. The debt we owe to Robert Johnson and his bargain with the guitar tuning devil is beyond knowing. Well what does all of this have to do with bikes? Maybe not much. I started to write it to talk about how being at a crossroads is scary, and sometimes you need to make decisions you are uncomfortable with in order to move forward. I was worried, though, about comparing our bike shop and the people who work here with anyone on a historical scale. 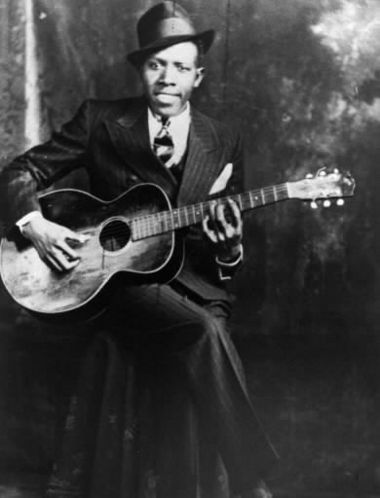 Robert Johnson deserves better than to simply be used as a metaphor for a blog entry. However, someone famous (can’t remember, paraphrasing) once said that you are dead as soon as the last person who remembers you and your name are dead. So maybe that makes any mention of Johnson and his legacy OK, especially if it leads even one of you fine readers out to go listen to some Robert Johnson recordings on you-tube or maybe even to buy some solid format recorded music, that novel and short-lived concept of the 20th century. I’ll put some links at the bottom of this post, so you can go look at them, if you want. We’re expanding here at Bike Doctor Frederick. We didn’t think, five years ago, that it would ever come to this. Over time, more people wanted more stuff, Triatheletes and all the things they need, mountain bikers and all their permutations, roadies and their lust for funny colored bar tape, family cyclists who wanted a nice basket or a fun bell. Suddenly we looked around and realized: we don’t have enough room to do what people want us to do. In a nut shell, bring in more fun stuff, more things that have to do with cycling but can be used in different ways, or more things that remind you of being on a bike, even when you are not. Like good books, magazines, hand-made T-shirts, cycling caps made by people we know, mugs made by local artists. We also want to be able to get people on the right bike, and once they are on it, we want them to be as comfortable as possible. Now, comfort means different things to different people. Comfort to a triathelete means riding in no socks with a number written on their leg and a tear dropped shaped helmet while bent over in a position most people associate with being hit in the stomach. Knowing this, we decided we needed a fit area. That was a big concern. A real place to get fit. A place we could be proud of, that was well equipped and had room for new fitting techniques. So we started our dream with that. Then we thought about our service department. It’s good now. Jason is fast, able, and grumpy. Everything a good mechanic should be. Also, opinionated about things no one cares about. Just like me, which is why we get along. We thought: let’s make the service area more efficient. Digitize stuff so things don’t get lost, add better lighting, more work area, carbon friendly bike stands. Update our tools to stay with the torque friendly times. So that became idea two for our dream. Lastly we wanted the shop to physically embody things we love about cycling, and in particular, cycling in Frederick County. We traveled to a friend’s house, where we sourced local salvaged barn wood (don’t worry, it’s just from a repair, his barn is still there) and big rocks. We’re rebuilding using local materials because we want our shop to look like it was born here. I worry about people thinking this is a money grab or a way for us to crush our competition. We’re friends with the other shops in town, and want them to stay around. All of us contribute to local bike advocacy. Tom at the Bicycle Escape and myself both serve on the Frederick Bicycle Coalition board. We drink beer together and tell jokes about weird bike repairs. I used to work for him, even. There’s an equilibrium with the Frederick bike shops, and we like it that way. We’re expanding to become who we wanted to be in the first place, a complete, comprehensive bike shop that is both friendly, helpful and a cool place to hang out. We’re putting in a coffee bar. Brandon aka Don BranDon aka Brantonio Branderas is going to build us a ride center, where you can pick up free cue sheets or study our bootleg Watershed trail map. Dan the Younger is going to drag us kicking into the digital age with a smoother retail management system, which will help us have the stuff we need in stock when we need it, so you don’t have to go on the internet and give your money to some faceless warehouse in Nebraska. I’d rather, always, you go give it to Tom or Wheelbase than to some internet warehouse in Nebraska. That was a really long article, thanks for bearing with us. We have some stuff going on this week, rides, plus a free clinic on Wednesday. 2/1: Bring in the first Wednesday of the down-trodden month of February with a fix a flat clinic. Not only will you learn how to shove a new tube in your tire, but also how to boot a torn tire, patch a hole in a tube, and how to use an old tube to make a really nice bungee cord for zero dollars. Maybe James will lead this, maybe Dan the Younger. 2/29: LIMITED CLASS SIZE…. max five, one position filled already, email us at bikedrfrederick (at) gmail (d0t) com to get in on the action: James (that’s me!) will teach you how to lace a wheel (you pick, front or rear) and tension it so it won’t explode on you, or crumble like Michelle Bachmann’s presidential chances. You’ll be buying some basic spokes (or really nice ones, whatever you want) a cheap rim, and a cheap hub to learn this skill. Get something you can put on your commuter, so it doesn’t go to waste. If you want to take this class, ya gotta buy the stuff from us, but we’ll point out OK cheap stuff. Figure this class will go to about 9pm. We need to hash out what you need soonishly, so let us know, with a quickness. 3/7: First Wednesday, so it’s a fix a flat clinic. See above for what that means. 3/14: How to overhaul and adjust a headset, assuming it can be overhauled and adjusted. What’s a headset? That thing that lets your turn the handlebars and therefore the front wheel, as well. Sometimes these get coated in sweat and grossness and need a good wash and regrease. If you generate lots of forehead sweat, or ride the trainer alot, this is a great clinic for you. Tuesday: Meet at the 7th street Starbucks if it isn’t crappy out for a 8am ride of a 70ish mile ride on a mixed surface. With The Don and Mr Doctor. Thursday: Meet at the same Starbucks for a 7 am ride around our fair county. 40ish miles, moderate pace, led by our very own Dan the Younger and Don BranDon. Back in town by lunchtime.